League City’s boards and commissions meetings will now include a public comment section on agendas after a recent ordinance change by a unanimous City Council vote. “I think good government is accessible to the people and if a citizen comes in and wants to speak at any one of our meetings and functions they should have the ability to do so,” said Councilman Hank Dugie. 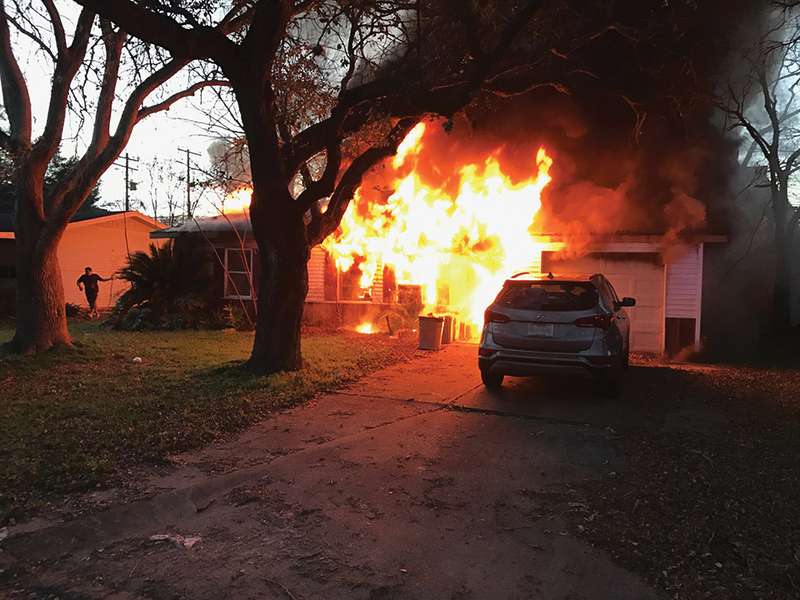 A woman was hospitalized with burns when the home at 205 W. Saunders St. in League City caught fire early Friday morning, Jan. 27. League City Volunteer Fire Department crews responded shortly before 7 a.m., arriving on-scene to find the house engulfed in flames. The fire was under control within 30 minutes; however, the house was a total loss. “Firefighters were on-scene within a matter of moments and their actions helped minimize the impact to surrounding houses,” League City Fire Marshal Tommy Cones said. The victim, who reportedly was burned while trying to save her dogs, was transported to UTMB – Galveston for treatment of injuries sustained in the fire. Three of her dogs survived. Clear Lake Regional Medical Center in Webster has been designated a Level II Trauma Center by the American College of Surgeons. It is one of two hospitals in the Houston area to be given the designation. The other is the Conroe Regional Medical Center. To attain the Level II designation, hospital emergency rooms must be staffed 24 hours a day by in-house trauma surgeons and especially trained trauma nurses. Surgeons must participate in major therapeutic decisions, be present at operative procedures and be actively involved in the critical care of all seriously injured patients. Clear Creek ISD has a named the 2017 District Spelling Bee champion. Fourth grader Amelia Young of Goforth Elementary won the first place trophy on Feb. 4 during the District Spelling Bee at Mossman Elementary School with participants representing all 36 elementary and intermediate schools in CCISD in attendance. She was crowned in the 15th round of the competition. The runner-up, fourth grader Fadhil Mohammed of Weber Elementary, was then named in the 16th and final round. The next competition is the Houston Public Media Spelling Bee, which will be televised live on April 1. The Houston event is the second largest in the country, with more than 1,000 schools from 42 Texas counties competing to be one of the top two spellers to advance to the Scripps National Spelling Bee, and win an all-expenses-paid trip to Washington, D.C.
Houston Councilman Dave Martin and the City of Houston’s Solid Waste Management Department are holding their spring Batteries, Oil, Paint (latex only) and Antifreeze (B.O.P.A.) recycling collection event Saturday, March 25, from 9 a.m. to 1 p.m., rain or shine, at the Ellington Airport Neighborhood Recycling Center, Highway 3 at Brantly Avenue for City of Houston residents. A valid Texas driver’s license or other proof of residency, such as a water bill, will be required. Residents may drop off scrap metal and large appliances – stoves, refrigerators, freezers and air conditioners. Items not accepted include: Alkaline batteries, electronic waste, oil-based paint, paint without labels, household hazardous waste/chemicals, business waste, medical waste, radioactive waste, PCB’s, Dioxins, ammunition, explosives, compressed gas cylinders, smoke detectors, household trash or tires. Empty latex paint cans or those that have hardened can be discarded with household garbage. Kemah’s City Council took steps in recent days that will bring in a new retail development that is expected to revitalize its downtown. More than a year of work and preparation led to the substantial decisions made by the City Council at its Feb. 15 meeting, when members voted to acquire more than one mile of right of way for future road development while also agreeing to terms with Nashville-based GBT Realty for the construction of a new retail center to be located just west of the Kemah Walmart on FM 518. The council also took action to move forward with construction projects to enhance the downtown area and open it up for greater access and development. Estimated value of the donated Right of Way, which spans three different commercially valuable private properties and connects FM 518 to SH 96, can be estimated at approximately $2.5 million in land value, Mayor Carl Joiner said. One of the properties involved in this project is under contract to GBT Realty for the construction of a new retail center, he said. Construction on this approximately 80,000 square foot facility is slated to begin in May and be open for business sometime in early 2018. Negotiations for other projects on the adjacent properties are on-going and progress on those is expected to be announced in the coming months. Council also approved a design contract with Houston-based SWA Design Group to remodel the city’s existing downtown parking lot at the Visitor Center creating a new park area, pedestrian promenade and flex space for parking. Another is a pedestrian walkway and 6th Street plaza/event area. The completed plan for all phases of the project will be presented in a community meeting at a future date.